Not that I've ever heard the song before, but the lyrics in itself, is way too cool. Suddenly I heard or read about a whole new line ups of local parlors, like, The Island Creamery, The ice cream gallery, The Daily Scoop, The Raffles Creamery and Tom's Palette .. WOW .. a whole list of ice cream parlors for me to check out .. cool eh .. I was grocery shopping at Parkway Parade when I had a sugar rush! The word Ice Cream was screaming at me and yeah, I needed my sugar rush fixed right there and then. The watch showed half past 8. I ran to the cashier counter, paid for my groceries and told DH to go to The ice cream gallery at Eastwood Centre. Believe it or not, we reached there just before the shop closes .. phew! There were alot of flavours to choose from, but I was rather disappointed when the ones that I wanted, - Teh Halia and Lychee, were unavailable. I settled for D24 Durian (been wanting to eat the king of fruit) and Avocado Gula Melaka (been wanting to drink Alpukat, a drink which is always served in Indo restaurants). They were both very nice and creamy. I particularly love the Avocado Gula Melaka, maybe because of its "lemakness". 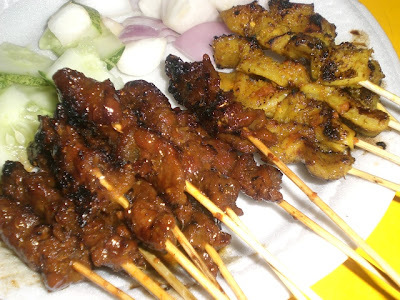 Everytime, I go to an Indo restaurant/stall, even though the Alpukat drink is on the menu, it is ALWAYS not available. So the Avocado Gula Melaka kind of made up for my crave for Alpukat. Oh yah, a scoop costs S$2.80 and a double costs S$4.20 .. easy on the pocket, I might add! So after ice cream, as we were walking to the car parked at Bedok Corner carpark, lil sis asked if I had extra cash with me. She wanted to eat at Bedok Corner. Being the nice sis, we went. Lil sis ate Mee Soto .. it was yummy and not oily ..
and I ordered Satay for all to share. After chomping food at Bedok Corner, I drove DH and Auni home first (coz it was way past Auni's bedtime) and then I drove lil sis home. Windows wound down and music blasted, I drove myself home, feeling all happy for there is no better treat than a frozen one .. ahh .. sweetness!! And happily, I have all the time, to check out all the ice cream parlours that's listed below. Even if I dont have the time, I'll try to make time. The ice cream gallery, checked! One parlour down and more to go ..
ewah ewah .. have u been meaning to tell me dat u have a internet connection at home NOW by asking me all those questions earlier on? do come by often yah! ohh...woww! so many icecreams everywhere. im sooo going to try every single parlor out there. haha! sempat eh! this one a few cents more ex than island creamery. ok continue exploring and reviewing pls! Yeah sis i like the mee soto its nice and its not oily... the ice cream is really sweet init? but its nice tho... oh yeah i miss alpukat tooo, we should have some soon... hahah you cant drink that... ull put on alot of weight haha..
m3rni3 to ibu aisyah - welcome to m3rni3. thanks for coming by yah me too i sooo need to try each and every ice cream parlor out. for now im so craving for tea tarik at the island creamery .. heard so much abt it! m3rni3 to hana - yep yep .. ex by 20 cents .. hehe .. will continute exploring and reviewing! m3rni3 to lil sis - ok lah .. not dat sweet lah or is it just my sweet tooth. yah i still want my alpukat drink too!!! hahahahah The Ice Cream Gallery is so shiok rite..some of their flavours like the Teh Halia, D24 and Alpukat are original, not found elsewhere. and look at your list! can't wait to see your other reviews! try Tom's Palette soon! the owner is very very friendly. EHHHH ACTUALLY THIS SUNDAY YOU CAN SNEAK DOWN TO TRY TOM'S PALETTE!! we are watching Ratatouiile at Shaw Prince. Tom's Palette is at the basement! wahahaha. And when we go to Batam, let's be sure to order Alpukat juice! yes shaz .. very the syiok! 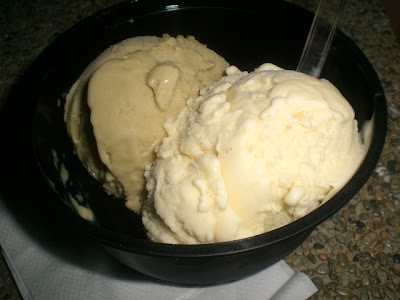 but sad too coz i didnt get my teh halia ice cream .. was so game to try that flava u know!! 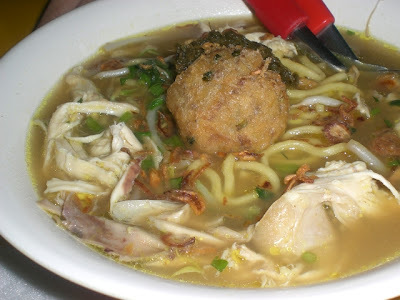 and yah .. id better get ma hands on some good original alpukat in batam .. slurp!! 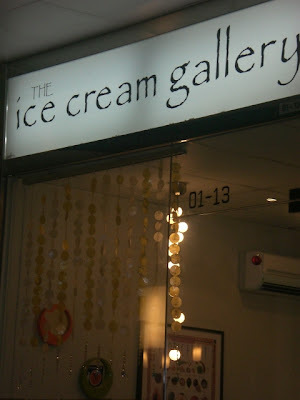 I particularly liked daily scoop and the ice cream gallery's ambience. tom's palette was quite small, so i thought i'd leave after i got my scoop. go, ice cream palours! i love ice cream! !